February 12, 2013 – It was brought to my attention today that not everything stated in the article below is 100% accurate. In a recent Facebook post Stephanie Shayne wrote that during the depths of the Depression he [her dad] was a union labor activist and was, for a brief time, a member of the Communist party. She further states that he soon became disenchanted with the movement and subsequently redoubled his efforts in the Union Labor movement. I regret that some incorrect information was posted here and apologize for any misunderstandings it may have caused. Be accurate, Olsen... first rule of the newspaper game. If a story's accurate you can't go wrong by printing it. Fans of the Adventures of Superman should recognize that line from Peril By Sea, an episode from 1955. Yet despite the fact that Jimmy followed the Chief's advice to the letter, our young Mr. Olsen still managed to get himself and his friends into so much trouble that in the end, Perry White told him, "I never want you to be accurate again." Of course Perry didn't mean really that. Accuracy is important... even concerning events that happened more than half a century ago. The pages of The Adventures Continue have always been about truth and accuracy, and we're proud of that. And with this column we hope to set the record straight concerning accusations and rumors that have been circulating for years in books and on the Internet about the day Robert Shayne was visited by federal agents on the set of Superman. Specifically, it's often been reported that Robert Shayne, who played Inspector William J. Henderson, was a "card-carrying Communist." Even a source close to the series has made this statement. Recently, however, Stephanie Shayne Parkin, Bob's daughter, asked me to help dispel that rumor and to clarify just exactly what happened on that infamous day back in 1951. While it is true that Federal agents did visit the set of Superman in 1951, it is not true that Robert Shayne was a card-carrying Communist. Here, in Stephanie's own words, is the truth about those events. Stephanie Shayne: When my dad died in 1992 I assumed I'd never again need to explain the events of that time, but the rumors persist, and I'd like you to help me tell the unvarnished truth. The fact is that Dad was turned into the House Un-American Activities Committee as a result of accusations made by his jealous ex-wife. That was precipitated by Dad's leaving her for a woman twenty-one years her junior (my mother, Bette). Dad maintained until his dying day that he was never a member of the Communist party. Indeed, my dad was a lot of things. He had his faults, but a liar he was not. He was honest and ethical about everything in his life with the exception of his marital indiscretions. But, his fidelity in marriage is not what is at issue here. The purpose of this is not to whitewash my dad's reputation. His life and career do not require that of me. I endeavor only to set the record straight. I have worked to stem the proliferation of such misinformation about Dad for many years. At first it was to defend him when he was too old to defend himself anymore. Now that he's gone, it's also about bringing no harm and lies into my mother's life, my legacy, and my life. Careless characterization of Dad does just that. It has brought harm and pain to both my mother and myself. I am an actor who still works in this town. To see parallels, one need look no further than recent events in our country.We find ourselves, again, in such a conservative political climate that some of our more visible actors, by simply speaking out against our country's going to war, can bring about accusations of disloyalty and lack of patriotism. The freedom to raise a dissenting voice is one of the principles our beloved country was founded on. 1) Dad was never charged by HUAC. The blacklisting came about by just being brought before the Committee in executive session. He never even appeared in the public, open hearings. There was nothing to charge him on. 2) No one other than his ex-wife ever stepped forward to corroborate the allegation. 3) Not one scrap of physical evidence with Dad's name on it was ever discovered to corroborate the allegations. No sign in sheets from Communist cell meetings... no ID cards... no membership rosters. Nothing. 4) Dad was cleared by the FBI almost immediately. I have the letters by the Senator that ordered the investigation on Dad closed. He was cleared. But the damage of gossip and innuendo and misinformation had already taken its toll. It is still taking its toll over fifty years later. 5) Since Dad died in 1992 I have developed a relationship with my half sister, Roberta. She is the only child of his second marriage. Her mother was Mary Sheffield Shayne. Mary was very angry that during her year long separation from Dad he took up with a my mother who was twenty-one years his and her junior. I would be too. In Roberta's and my many discussions the blacklisting has inevitably come up. Among all her mother's papers, there is not one shred of physical evidence to support the charge Mary Sheffield Shayne made. 6) I have the transcripts of his appearance, in executive session, before the Committee on House Un-American Activities. Before their deaths, I had spoken with Jeff Corey and Adela Rodgers St. John. I have spoken with John Randolph, Betty Garrett and Will Geer's daughter, Ellen. I have done a good deal of research in order to have the facts exactly correct. That moment on the lot was Dad's detainment for questioning by the FBI. It wasn't even an arrest. They served him with a subpoena to appear. 7) Dad and I talked about the McCarthy years and its aftermath many times. I was one of the few people he would speak to, openly, about it. He maintained to his dying day that he was never a member of the Communist Party. Since his death I have searched all of his archives. He saved everything. There was nothing in his papers that ever indicated his membership in the party. Since Dad was an honest and ethical man, in the absence of any proof to the contrary, we must honor his declarations. The internet is an awesome global communication device. It is more powerful that any newspaper or book could ever be. This myth of my dad's membership in the Communist party continues to be misstated in idiotic interviews by ignorant people that know nothing of the facts. The more often that misinformation is repeated, the more it is accepted as truth, and the harder I have to work to set the record straight. After reading Stephanie's remarks, I asked her these additional questions which she was kind enough to answer. 1) Do you have an exact date the agents arrived on the Superman set? No, sorry. Dad refers, in his testimony given on September 11, 1951, to the fact that the service of the subpoena put him out of a job. He also states "the way the subpoena was served upon me was not in the best of, let us say, spirit." He states a couple of sentences later that "the subpoena had my residence address on it. I could have been served out there just as easily without it being brought to such-the attention of studio employees, because the fact that a person is called before this committee, although they may be friendly or not, far too often is tantamount to being guilty of something or other, whatever that may be." It sounds as though he was served prior to the September 11, hearing. I don't know exactly, but perhaps it was the day before, Monday September 10th that he was served on the lot. Mom remembers him testifying on a different day than the one he was served on. 2) Was it Maxwell or Ellsworth who stood by your dad? Did you dad ever mention specifics on that? It was Bob Maxwell, he was the producer that took the stand against firing Dad. Whitney Ellsworth came along later after the first season, although his continued support was always appreciated. Dad was always grateful for work. 3) George is often mentioned as showing loyalty toward your dad at this time too. Did you dad every mention that? Yes, George, Bob Maxwell and generally every one connected with the series was supportive. 4) Did your dad miss work on "Superman" because of this incident. "Human Bomb" in 1951 featured Marshall Reed as Deputy Inspector Hill. It is often reported Reed was in that episode because that's when Shayne was served. "Human Bomb" was filmed between September 6 and 15, 1951. Yes. Tuesday, September 11, 1951 was when Dad appeared before the Committee in Executive session. Dad mentions losing three days employment with Superman Productions, at RKO-Pathe, during his testimony. So, what is widely believed about the "Human Bomb" episode must be correct. The dates do match. Dad states that his producers asked for a postponement, but the Committee denies ever knowing that a postponement was requested. 5) On "Tomorrow" with Tom Snyder in 1976, you dad spoke of being blacklisted. Did he feel that blacklisting was a direct result of this incident or was there more to that? No, all the blacklisting of the people in Hollywood, writers and actors alike, came about as a result of people being brought to the hearings whether they were members of the party or not. We must all remember it has never been against any law of the United States of America to be a member of the Communist Party or any other political party or religious affiliation for that matter. Every person that suffered and endured questioning or the resultant blacklisting had their civil rights violated. It was a very sorry chapter in our history. That is why I work to keep the record correct. 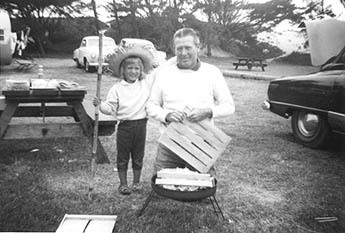 Stephanie and Bob Shayne at Carpenteria Beach, 1955. 6) I spoke with your dad regarding George's reported drinking on the set. He told me he never recalled George drinking to excess, yet Phyllis often makes remarks to the contrary. Well, Dad would never have said so even if he felt George had been drinking to excess. But, I can say this. Dad was very fond of George, Jack, Phyllis, Noel and John. He always said he had a lot of fun working on the Superman set. Dad was the consummate pro. He showed up for work, on time, knowing his lines and didn't get into anybody else's business. He was grateful for the job. He had a family to support. 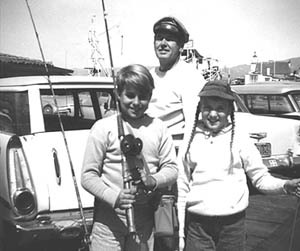 Robert Shayne with his children, Bob, Jr. and Stephanie. Read past pages "From The Editor."